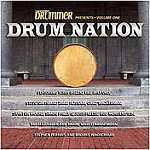 Review: "Modern Drummer Presents: Drum Nation Vol 1" - Sea of Tranquility - The Web Destination for Progressive Music!
" Drummers form a unique community. When a drummer gets sick or falls on hard times, the 'nation of drummers' rallies to help. When a drummer needs a tip, there are no secrets, only sharing. In recognition of this communal spirit, Magna Carta Records' Pete Morticelli conceived the Drum Nation project "
A mixture of samples, loops, disembodied voices, lead synths, and real drums create a result which is, in Terry's words:" ..so intense and relentless that it seemed to reflect my own manic/depressive/obsessive/compulsive mental machinations...hence the title ! " A reworking of the first tune Bill ever wrote for his first solo release in 1977. It features a quartet which were a one-take band, not concerned with an antiseptic result from too much tooling with the song. Eastern sounding number featuring fusion legend Steve Smith and excellent tabla player Zakir Hussain. Also features some very interesting sitar courtesy of Fareed Haque, and some inspired sax squonking from George Brooks. One of the stronger numbers on the disc.
" I decided to call the tune The Spell because of its dark, menacing mood. " - Chad Wackerman. Modern fusion featuring guitarist James Muller and the vibes of Daryl Pratt. Punctuated throughout with many fills and rolls from Mr Wackerman. A very solid number. Featuring the Lil Rascals Brass Band Horns. I'll let Mr Moore describe this one to you: " To me, this cut is what a culmination between a funk band and a brass band band should be: loose, fun, and fat. " A very danceable number which has you bopping in time with Stanton's drums . Great B-3 solo in the middle portion. A song that came together very quickly as it was cut in just a couple of hours. A few overdubs later, and the product was ready. All in a day's work. This one has Mr Phillips ( which you metalheads may know as the drummer on Judas Priest's Sin After Sin album) pounding ferociously over the superb guitar work of Andy Timmons, and punctuated throughout by the analog keys of Jeff Babko. This one definitely has a '70's feel to it. I'll just add that this is easily the 'rockingest' tune on the disc. Named after a remark made by a critic who called Dixie Dregs music a faceless pastiche ( meaning all over the place, not fitting into any one category) this number has Mr Morgenstein reuniting with Jordan Rudess in a frenzied fusion piece with plenty of openings for Mr Morgenstein to showcase his chops. The title pays hommage to Frank Zappa and his ' Shut Up And Play Yer Guitar' collage of solos looped together. Tim and Brain had two days to record this one but wasted the first day in attempting to record seperately and mix the result together. With only one day left, they just basically winged it, giving us a track which has a spontaneous 'jam feel' to it as it builds to a crescendo. A one-man band who named the song after the town he wrote it in during a day off from his solo tour. One of the mellower numbers on the disc but still containing some inspired, odd-time drumming. A conversation between two drum kits which builds in intensity as the track progresses. The second part of the track introduces hand percussion into the fold. I must admit that I was very skeptical when I saw this disc tumble out of the bubble-pack envelope from the editor. My preconceived notions were quickly sated. Filled with accomplished drummers, this disc does not veer off into over-indulgent wanking. Dedicated to Modern Drummer Magazine founder Ron Spagnardi who died just as the production of the disc was in it's final stage.